My husband and I saw The Purge last night. It was a really great movie, but we got into some ethical arguments…turns out we have very, very different perspectives on humanity. 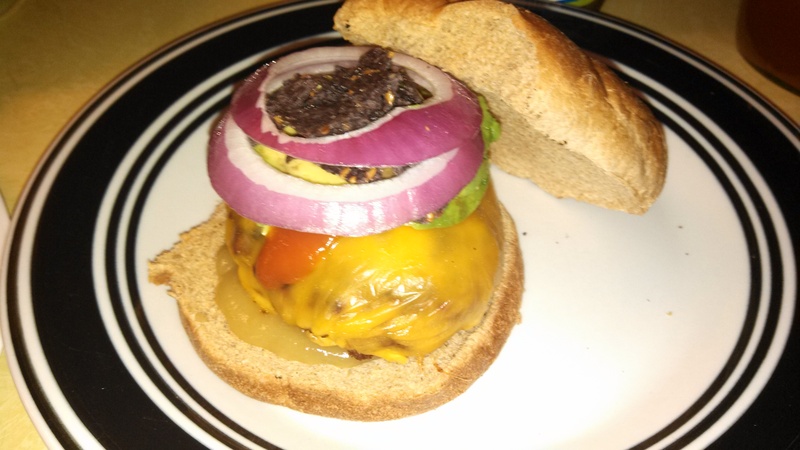 That aside, before going to the movie, I made these amazing taco-rubbed burgers. I’m pretty sure they’re my new favourite burgers, and they were SUPER easy to put together. Seriously. They were perfectly moist (that’s what she said), incredibly flavourful, a little spice but not overpowering, and a nice change of pace from a generic ketchup-and-mustard burger. Yum yum. 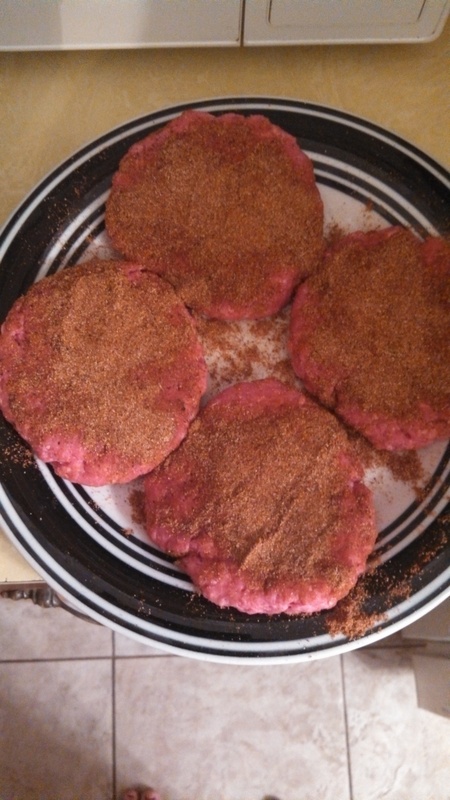 Four patties (1lb total) and the homemade spice rub ready to go. 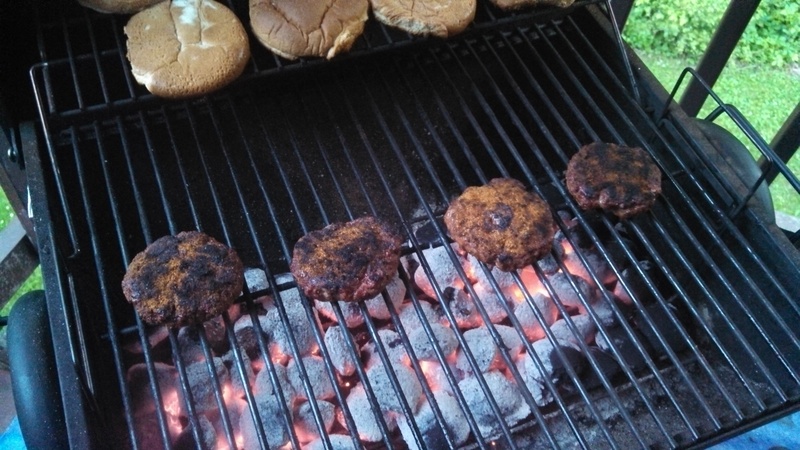 It seemed a bit odd to press the spices into the patties, as opposed to mix them with the meat, but once we were eating them, it did make more sense. Some of the spices fell off, but I just pressed the patties into the plate a bit in order to pick up the leftovers. We were briefly worried, because the spice rub was burning a bit. But the final product didn’t taste burnt in the slightest. And the burgers themselves were perfectly medium rare. -In a bowl, combine ground beef with salt and pepper, mixing to combine. 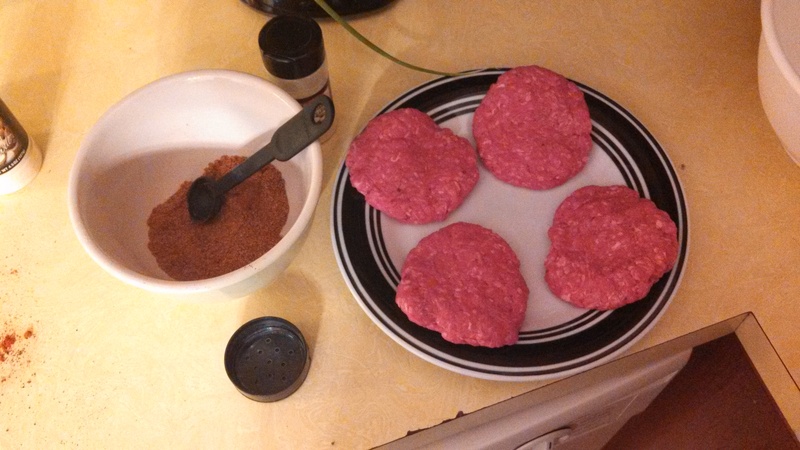 Form beef into four equal patties. -In a smaller bowl, combine cumin, paprika, chili, garlic and onion powders together and stir well to mix. Pick up each burger and using your hands, rub both sides and the edges of the burger with the spice rub, gently patting the spice in. -To cook, prepare the burger as you’d like – whether grilling it until your desired doneness or cooking it in a hot skillet for about 5 minutes per side (we grilled, of course!). -Add cheese on top 1-2 minutes before finished so it has time to melt. -To serve, add salsa verde to each bottom bun, add the burger then add avocado, onion, salsa and crushed tortilla chips on top.